1. Castile soap. Whether you use a bar or liquid soap, this all-purpose soap cannot be beaten. I personally like Dr. Bronner's soap the best, but I have not an issue with any other Castile soap. While I am all for a good all-purpose soap like Castile soap, some people do not like using the same soap for everything. With Castile soap, you can use it for cleaning floors, dishes, laundry, your body, hands, and even shampoo for your hair. If you buy the bars of Castile soap, you can grate them and dissolve them in water to make liquid soap. If you are going to stockpile any kind of soap, this would be my first pick. 2. Bar Soap. I keep bar soap for showering and washing hands. This soap can be grated and mixed with hot water to make liquid soap. Bar soap also doesn't go bad quickly and can often last for several years. 3. Body wash. This is a quick and easy solution for keeping bodies clean. You can also use it as a hand soap in a pinch. For guys, the all-in-one body wash (hair and body) is quite convenient and cuts down on what you need to store for them. I like to pick up the cheap $1.00 body washes from Dollar General or Dollar Tree, but you can store and use whatever you like to use. 4. Hand soap. You can use bar soap or dish soap for hand soap, but I also store hand soap. This keeps the hands clean and can be used as a body wash in a pinch too. 5. No water hand soap. I keep Fast Orange or Goop on hand to clean hands when water isn't available. This is great to have in shops and garages, but when water is scarce or needs to rationed, this will clean your hands without wasting water. 6. Dish soap. Whether you are planning to wash dishes or anything else, dish soap is a must to have. I stock all kinds of cheap and not cheap dish soap, but I like to have some on hand that will cut the grease. You can also stockpile dishwasher soap or tabs, but this is not a priority for me. 7. Laundry detergent. You will need to wash clothes whether you want to or not. While you need to have a way to do wash clothes, you will definitely need soap for that purpose. You can stock powdered or liquid. If you make your own, you will need to stock the ingredients to make the laundry detergent. 8. Shampoo (and conditioner). While having clean hair is not a must, it will make you feel better to feel clean. My hair gets greasier in a day no matter what I do (and I have tried it all). Having clean hair helps me feel cleaner. 9. Toothpaste. Toothpaste and a good toothbrush is a must for oral health. Whether you use fluoride or non-fluoride toothpaste, brushing your teeth keeps the bacteria and germs out of your mouth. Besides that, bad breath is definitely not a good thing. When buying toothpaste, make sure to pick up some floss too. 10. All-purpose cleaners. You will need to keep things sanitary. You will need a good all-purpose cleaner or spray cleaner to keep the surfaces clean. You can buy a special cleaner for different purposes, but I just use a good all-purpose cleaner to keep the counters and other surfaces clean. You can also stock up on cleaning wipes just in case you are in a grid-down situation and water is scarce. 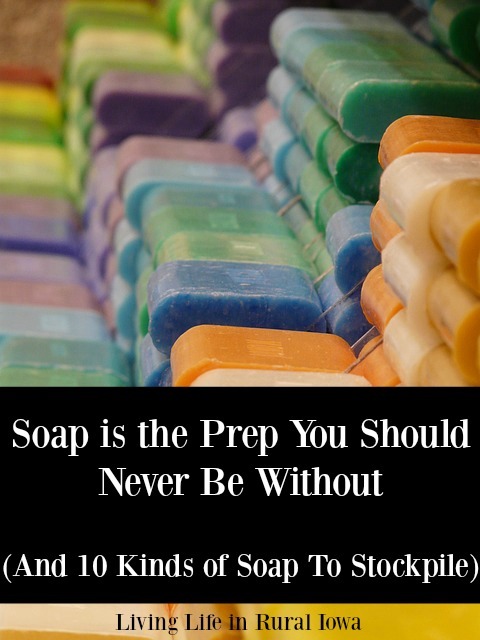 There are other soaps you can stock up on, but these are the top ten I like to have on hand at all times. They cover all major needs and will keep my family and myself clean, safe, and sanitary when the germs are abundant and staying healthy is critical.